Kimberley diamond mine, historical artwork. 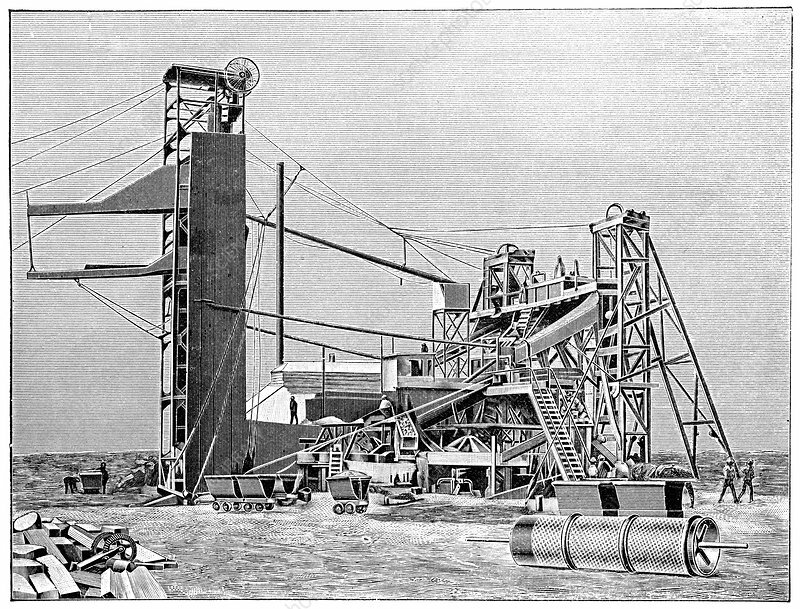 Screening facility to filter diamonds from the excavated rocks and soil at the Kimberley diamond mine in what is now South Africa. The Kimberley Mine, also known as Big Hole, began to be excavated from 1871 after diamonds were first discovered here. Over the following 43 years the excavations created an enormous pit some 460 metres wide and 240 metres deep. Tens of thousands of miners extracted millions of tons of earth, containing around 3000 kilograms of diamonds. Artwork from the third edition of 'Les Entrailles de la Terre' (1902) by French author Eugene Caustier.